Noun. Plural caducei. Late 16th century. usually represented with two serpents twined round it. Here's some trivia for you: What does the Caduceus represent? If you said Hermes, Mercury, their wands or the messages they bore in their capacity as messenger-gods, then well done you, and I would hazard a guess that you either did a term of classical history in school or you actually read the above definition of Caduceus before moving on to my inane ramblings. If, however, you said the medical profession, doctors or healing, then a big, loud, Family Fortunesque buzzer in your ear. Or maybe not. 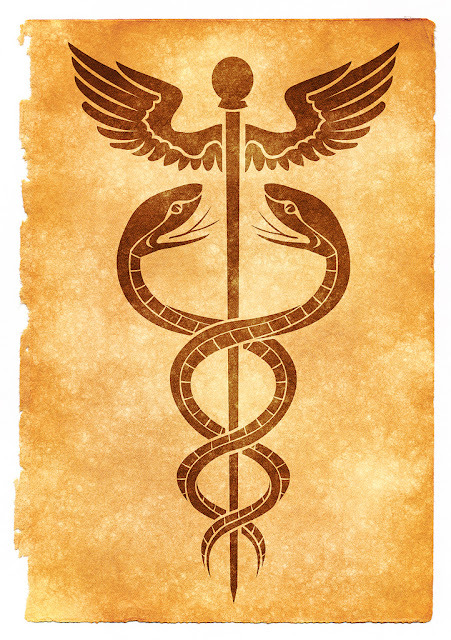 The problem is that the Caduceus is often confused with the Rod of Asclepius, the difference being that the Rod of Asclepius is usually portrayed as a genuine staff (rather than a wand or sceptre) with a single serpent entwined around it. Crucially, it is also an authentic symbol of medicine, as Asclepius, the son of Apollo and Coronis, was instructed in the art of healing by the centaur Chiron, and even knew how to bring the dead back to life. After being killed by Zeus, Asclepius was proclaimed the god of medicine, having been held to have been the first physician. Thus, his symbol, that of his staff with a single serpent wound about it, is the familiar symbol of doctors today. So what of the Caduceus? Isn't that also used as a symbol of medicine? Well, yes, but erroneously, originating with the US Army Medical Corps in the mid-19th century, seemingly as a result of simple ignorance of both classical mythology and iconography. 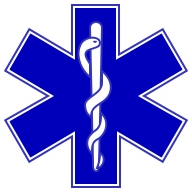 Its use as such stuck, however, particularly in the US, even though many commentators have written that the Caduceus is a wholly inappropriate symbol for doctors, being the wand of Hermes, the trickster god of traders and thieves, conductor of souls to the underworld. Thus, the Caduceus has historically been more fittingly used as an emblem of commerce. Do you use the Caduceus as your symbol? Does your doctor know his Asclepius from his pancreas, his Hermes from his herpes, and his Venus from his ... oh never mind. Do please prescribe your divine comments into the box below. You are incorrect, as the sybullogy of this predates Greek.